NLM in Focus is pleased to share this tribute from US Senator Chris Van Hollen that was recently published in the Congressional Record. The tribute features a resolution presented to Betsy Humphreys by the NLM Board of Regents in May. Humphreys will be retiring from the National Library of Medicine at the end of June after 44 years of public service. The Congressional Record provides the official record of the proceedings and debates of the United States Congress. Mr. VAN HOLLEN. Mr. President, as a Member of the Senate who supports efforts to build support for biomedical research and improved public health, I would like to pay tribute to a great public servant and the first woman and first librarian to lead the National Library of Medicine, NLM, the world’s largest biomedical library and a part of the National Institutes of Health. Ms. Humphreys recently announced that she will retire at the end of June after 44 years of extraordinary leadership and distinguished public service. On May 9, the board of regents of the National Library of Medicine approved and presented the following resolution to congratulate, commend, and thank Betsy Humphreys for her 44 years of service to the NLM. I would like to share that resolution with my colleagues and join the NLM board of regents in paying tribute to Betsy Humphreys, a public servant who has had a profound and lasting impact on the NLM, the United States, and the global community. I ask unanimous consent to have the text of the resolution printed in the Record. Ms. Betsy L. Humphreys has served NLM, the United States, and the global community with distinction since 1973, culminating in her appointment as the NLM Deputy Director in 2005, a post she continues to occupy today, and serving as NLM Acting Director from April 1, 2015 to August 14, 2016—the first woman and first librarian to lead the Library. In a career that could be called one long highlight reel, she directed the groundbreaking Unified Medical Language System project, which produces knowledge sources to support advanced processing, retrieval, and integration of information from disparate electronic information sources, and which is used around the world. In the process, she developed unique knowledge and experience with the content and format of many biomedical terminologies, health vocabularies, and clinical classifications that would serve her well in all endeavors to follow. She was a key contributor to interagency efforts to advance standardization of electronic health data, which resulted in the development, promotion, and implementation of mechanisms for designating US standards for health data exchange. She was also a major contributor to the Federal regulation setting the standards for use in electronic interchange of administrative health data. Taking a broader view, she led US government efforts to remove major barriers to the use of standard clinical terminologies in electronic health records (EHRs). Before there was an Office of the National Coordinator (ONC) for Health Information Technology within HHS, she negotiated the world’s first nationwide license for a clinical terminology, SNOMED CT, with usage terms favorable to the US. This became a model for other countries and was adopted by the International Health Terminology Standards Development Organisation (IHTSDO) when it was formed to put ownership of SNOMED CT in an international entity. She was IHTSDO’s founding Chair and has served with distinction as its US member. With the establishment of the ONC, she led NLM’s substantial and ongoing collaboration with that body to develop, support, and disseminate for free US use the key clinical terminologies required for certification of EHR products and use of EHRs by Medicare and Medicaid providers and hospitals. She also directed the development and dissemination of many tools, including mappings, subsets, browsers, etc., and innovative systems, including the NLM Value Set Authority Center and NIH Common Data Element Repository, to support the use of standards in health care, quality measurement, and in research. She directed the legislatively mandated expansion of ClinicalTrials.gov to encompass registration of additional trials and submission of summary results information. This multi-year, multi-faceted process involved numerous partners and stakeholders, showcasing her ability to grasp and solve complex problems and her considerable skill at consensus building. ClinicalTrials.gov is the largest and most heavily used international clinical trials registry. She worked tirelessly and creatively to expand and enhance access to research publications, data, and high quality health information for scientists, health professionals, system and product developers, information professionals, and the general public. This often involved building and maintaining strong partnerships across the Federal government to adapt and rebrand strategies to changes in Administrations and priorities and to capitalize on emerging opportunities. 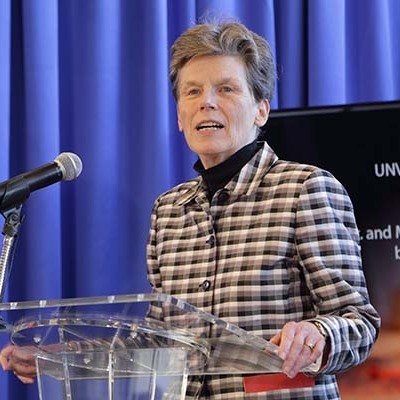 She oversaw the expansion of PubMed Central to include direct deposits of articles from many publishers, manuscript submissions from investigators of publications resulting from NIH-funded research and research funded by other Federal agencies and private funders, including the Gates Foundation, and digitized articles from back issues of biomedical journals, through a partnership with the Wellcome Trust. She led a collaboration with the Food and Drug Administration (FDA) to make drug information and device registrations submitted to the FDA by product manufacturers available to the public via NLM’s heavily used DailyMed system. In addition, she guided the creation of the AccessGUDID database, which provides public access to registration data for medical devices. Under her enthusiastic direction, NLM became an early implementer of application programming interfaces and download sites for its many heavily used data and information resources, flinging open the gates and allowing their use by other computer systems and by innovative product developers. As NLM Acting Director, even in the face of hiring restrictions, she enhanced the quality and efficiency of NLM’s high-volume operations, ensured reliable 24/7 availability of electronic information services that are essential to research, health care, and public health worldwide, and advanced major initiatives, including the re-competition of NLM’s Informatics Research Training Grants and the re-competition and migration from contracts to cooperative agreement grants of the Regional Medical Libraries in the National Network of Libraries of Medicine. Throughout her career, in an exemplary fashion, she demonstrated creativity, adaptability, and resilience in partnering with stakeholders inside and outside of NLM. She leads by fostering employee development, diversity, teamwork, and making optimal use of human, financial, and information resources. Throughout NLM, she is respected and indeed beloved for her kindness, her resourcefulness, and her can-do spirit. Truly a treasure as a human being and as a public servant, she demonstrated a career-long commitment to interagency collaboration and harnessing government resources for the public good. June 16, 2017 in People.